The tour starts at our convenient location on the corner of Kaiulani and Kalakaua. We'll make sure everyone is on the right sized bicycle and give you a safety introduction. From there we'll head out along the Waikiki waterfront towards Diamond Head. We'll pass the Waikiki Zoo, Waikiki Aquarium, Waikiki Natatorium War Memorial, before we loop back along the Lei of Parks. We'll ride to Kaka'ako and view the building murals created during the Pow! Wow! event. 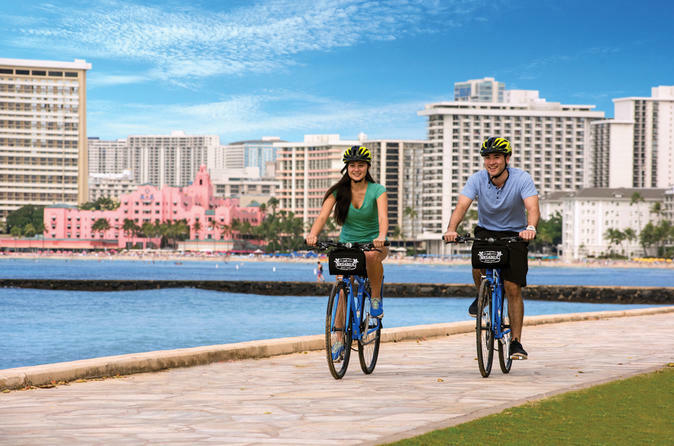 We'll ride along the waterfront through Ala Moana park and back into Waikiki. This tour takes approximately 2 to 3 hours and is mostly flat. Includes basic hybrid bicycle (electric-assist available for additional charge). Also includes bottle of water or powerade and snacks along the way. The tour will finish back at our shop in the heart of Waikiki.